Fun Family Projects: We’re Going on a Gag Reel! Well, as with all movies nowadays, with all the extra footage from J’s ‘We’re Going On a Bear Hunt’ school project, we decided to put together a silly little gag reel with all the bloopers, deleted and extended scenes! Toko Aljunied saves the (Racial Harmony) Day! In Singapore, we celebrate Racial Harmony Day on the 21st July every year. This takes place on the anniversary of the 1964 racial riots in Singapore where a celebratory procession (following the president Yusof bin Ishak’s formal address) in honour of the Prophet Muhammed’s birthday turned violent, leading to the death of 23 people and leaving 454 people injured. 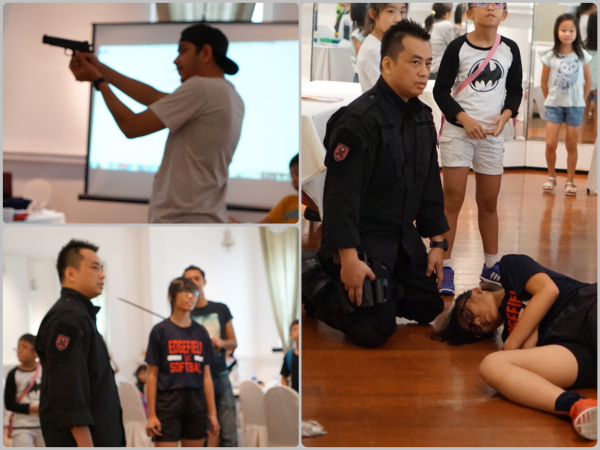 These riots exposed the serious racial tension between the many races that make up the Singapore population. On Racial Harmony Day, school going kids are encouraged to wear traditional ethnic costumes to school and the day is set aside to celebrate Singapore’s success in building a racially harmonious society with a rich and diverse cultural heritage. In Little E’s kindergarten, they will have the opportunity to sample traditional snacks during class. Usually, I put Little E in her Chinese New Year cheongsam, but as we did not celebrate Chinese New Year this year, I was at a loss as to what to do. Then I remembered that I needed to get her a special outfit for A Becky Lee’s wedding dinner later this year and I was planning to get myself measured up for a new sarong kebaya for the occasion (having outgrown the kebaya that I wore for my own engagement celebration more than 10 years ago). So why not get her a little one to match? Additionally, it would be appropriate to celebrate our family’s Peranakan heritage on Racial Harmony Day! I had purchased my sarong kebaya many years ago during a trip to Malacca with the Aged Ps, but this time, I decided that I would look for a kebaya shop locally. 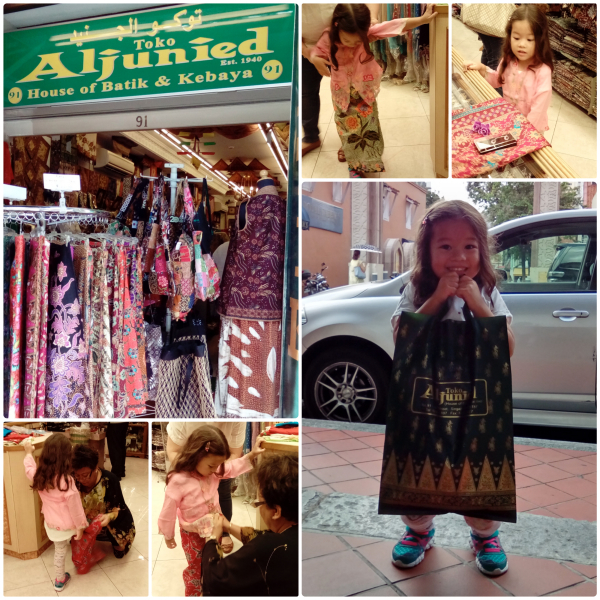 I asked around my network of friends and found out from Delphine (from Life in the Wee Hours) about Toko Aljunied, which is a very well-established Batik and Kebaya shop, located on Arab Street. She’d been there a few years ago to buy outfits for herself and her daughter, and had been very impressed with them. I had no idea at the time, but Toko Aljunied has tailored traditional Peranakan wear for local stage and television productions such as ‘Emily of Emerald Hill’ and ‘The Little Nyonya’, and is generally favoured by our current Prime Minister as the place to get beautiful one-of-a-kind silk batik shirts for formal functions! Parking at Arab Street is normally a nightmare, however, Toko Aljunied is two minutes walk from the Golden Landmark Shopping Centre which has a nice basement carpark. Win!! At Toko Aljunied, the Makcik who owns the store kindly brought out a few ready-made tops in Little E’s size, saying that she would adjust the sleeves on the spot if they were too big for her. I noticed that the material used to make the sheer tops were all traditional cotton robia, which is a very fine, light cotton voile, and the lace-like embellishments (known as ‘sulam’) along the collar, hem and cuffs were all embroidered directly onto the material – that is, they weren’t appliqués that were stitched on. Now comes the difficult part – matching the kebaya top with a sarong skirt! With my poor colour sense, I would get lost and confused in the multitude of colours and swirling motifs that make up the batik print so I was very pleased when the Makcik proceeded to expertly pair the top with a variety of sarongs, each making the whole outfit look more beautiful than the last. Although the child-sized kebaya top is conveniently fastened together with hidden popper buttons, no sarong kebaya ensemble is complete without the ‘kerosang’, a fancy three-piece brooch joined together with a long chain. The Makcik picked out two types of ‘kerosang’ for Little E, one with gold with rhinestones in the shape of a flower and one set with purple stones. Little E went with the purple stones, so the Makcik went to the front of the store and picked out purple flower hair clips to match! All in all, the whole ensemble set us back SGD$80, which is very reasonable! Best of all, Little E loved it. You can see her happy little face in the picture above, as she clutched the shopping bag with its precious cargo! 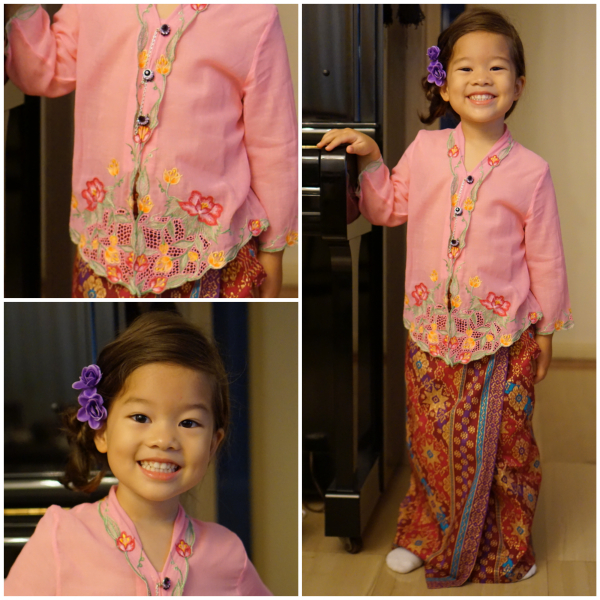 Little Nyonya proudly wearing her kebaya! I am so glad the Little E is embracing her Peranakan heritage! I am now thinking of revisiting the shop to get J a traditional batik shirt…and I must remember to get the Aged Ps to bring them to the Peranakan Museum again. Now, you may remember that I wrote about the importance of creative writing and J’s experience at a 3-day workshop with Monsters Under the Bed (MUTB) earlier this year. 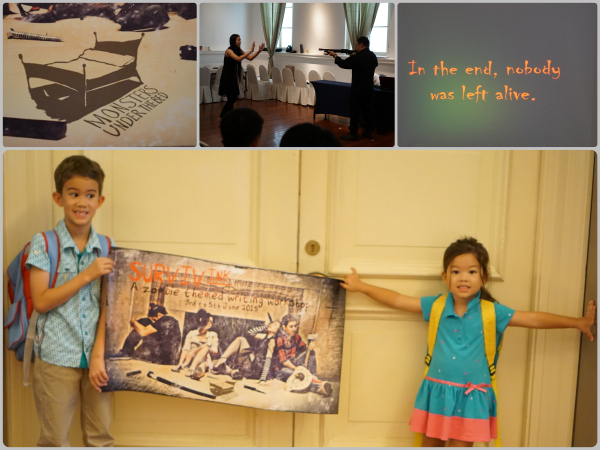 J enjoyed his experience at the EpicQuestINK workshop so much, that he was absolutely delighted to be invited back to attend another Imagination and Knowledge “INK” creative writing workshop with MUTB during the June School Holidays – the SurviveINK workshop! 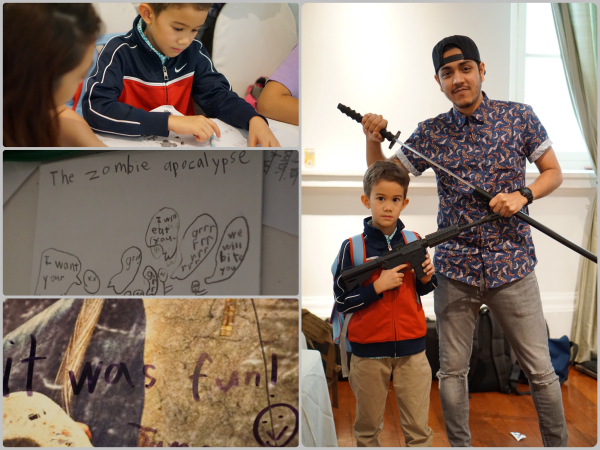 The tagline for the SurviveINK camp was “With friends like these, who needs zombies?”, so we were prepared for him to have a zombie-themed writing workshop. J is quite familiar with the concept of zombies, having come across them during our weekly family jaunts into the world of Minecraft. However we weren’t prepared for the scale of the SurviveINK holiday camp as presented by MUTB! It was a total immersive experience! I was so impressed by the commitment and dedication of the MUTB trainers in putting this together for the kids. A week prior to the start of the workshop, J received an email warning him of a zombie-virus epidemic and advising him to prepare himself. This was a brilliant way of getting J to think about what items and skills he might need in order to survive without basic comforts and also how people might behave when faced with impending doom. To get him hyped up even more, we received a link to this video on the eve of the workshop! WOOHOOOOOO!!! What a way to get the adrenaline pumping! J could hardly get to sleep for the excitement of it all. The next day, J, Little E and I (as well as Thumper, drowsing in his sling) headed to The Arts House. We were greeted by a dude in SWAT gear and gas mask (“Sgt Leroy”), patrolling the hallway with a huge gun, whilst a nearby radio played a broadcast in the background, warning us that infected persons will be shot on sight. You can tell by the big grin on J’s face that he was ready for a real adventure! At 10am, the doors burst open with a clang, and out stalked a lanky, long-haired titaness towering over everyone and wearing the most frightening stilettos I had ever seen. This was “Goth Leader” Xiangxiang, who seemed to be in charge of running the SurviveINK workshop this time. Some of the more mild-tempered children were clearly very intimidated by her brusque manner and hid behind their mums. Not so much J and Little E who were getting more bloodthirsty by the second and asking me if they were going to shoot zombies now or later. Inside the hall, the children were divided into groups by age, and the various trainers introduced themselves and went through the SafeHouse rules before leading the kids through their first exercise of the day – a creative brainstorm called the ‘Ice Bucket Challenge’. 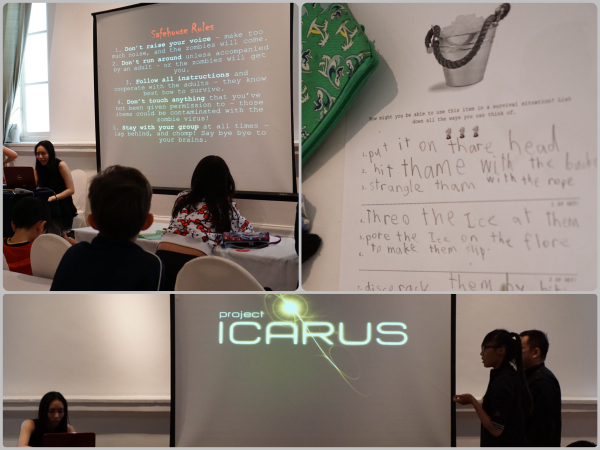 Each child had to come up with as many uses as possible for a bucket of ice should the zombies start to attack the safe house. J immediately came up with a whole bunch of different ways to deal with zombies using a bucket of ice and he scribbled all of these down on his worksheet, ignoring grammar, punctuation and spelling in his haste to get as many ideas down in a short period of time. I was very surprised that he came up with more than ten ways to dispatch zombies using an ice bucket! This was the first of several creative challenges given to the kids during the duration of the workshop. 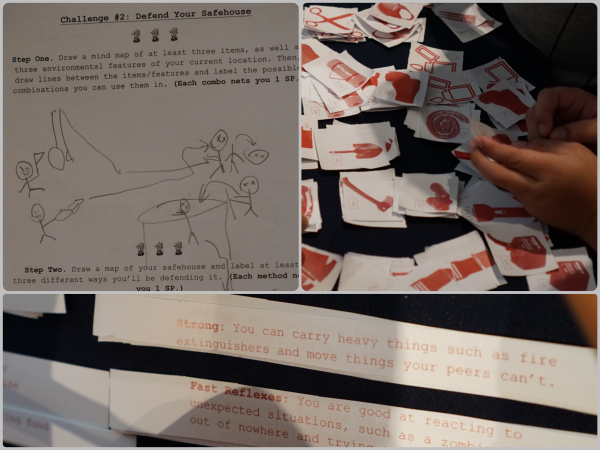 At the end of each challenge, the kids were given points based on the quantity and complexity of their ideas, and they could use these points throughout the workshop to exchange for skill sets and equipment. This helped them to be more focussed when thinking of characters for their stories and what strengths and weaknesses their characters would have. It also ensured that they did not create superhuman characters with infinite resources which would make for less tension and conflict in their stories. Points for weapons and skills! At the end of the first day, the children were informed that Safehouse had managed to get into contact with the university laboratory which was responsible for ‘Project Icarus’, the source of the zombie virus. The trainers spoke over the speakerphone to the scientist who had barricaded herself in the lab as zombies hammered on her doors. She had developed a potential cure but hadn’t had time to test it yet! We listened in horror as we heard the zombies smash the laboratory doors down and attack the scientist whose conversation was cut off with a bloodcurdling scream. There was a hideous moan, followed by the wet sounds of chewing. One of the trainers, who was playing the role of Lab Assistant, broke down in tears as the children looked on in concern. We were told to go and find a safe place to rest and reconvene in the morning. Well, how’s that for a cliffhanger ending to the first day at the SurviveINK workshop? J could not wait to return to find out what would happen next, and spent the afternoon discussing with Little E various methods of faking one’s death for a speakerphone conversation. The next morning, when we arrived at the Arts House, we were congratulated by the gun and pistol wielding MUTB trainers for reaching the ‘Project Icarus Lab’. The MUTB trainers had smeared dirt on their faces and were bespattered with what looked like blood. Dishevelled and panting from exhaustion, they told all the wide-eyed children that they had cleared the whole area of all the zombies overnight but had realised their zombie-detection alarm was still going off. Was it malfunctioning? The children were each assigned a face mask and latex gloves, and told to enter the Project Icarus lab to look for clues to the location of the zombie cure. They went into the room in batches according to their assigned groups. When it was finally J’s turn, we entered the room to find that it had been transformed into the Project Icarus laboratory, with glass beakers, petri dishes and even a toy microscope! Chairs and tables were overturned and there were signs of a scuffle. Impressive! After searching around the room, J and his group mates found a bloodstained note as well as several bottles of suspicious looking liquids in various colours. In their groups, they spent some time figuring out the code and decoding the note in order to find out which bottle contained the potential zombie cure. In the meantime, the kids began drafting their first ideas for their zombie-themed story. J’s idea was to bake the antiviral medication into pies and launch them at the zombies who will inadvertently consume the medicine after receiving a pie-to-the-face. “Then they will be cured!” said J in triumph. During the core of the day, the trainers revealed to us that the experimental drug only had a 50% chance of working to cure an infected person and inoculate a non-infected person. If it didn’t work it would either speed up the zombification process, else turn a non-infected person into zombie straightaway. Xiangxiang pointed out that the zombie-detection alarm was still going off so somebody in the room was infected with the zombie virus. At this, all the children in the room started getting very excited, each pointing at the various trainers, yelling at the top of their lungs and accusing them of being zombies. At the end of the second day of the workshop, Xiangxiang accused the Lab Assistant (who had been coughing and shuffling her feet and generally acting suspicious all day long) of being infected, forcing her to drink the experimental drug. Unfortunately, she turned into a zombie and had to be dispatched! “WHOA!” gasped the room in unison. Sgt Leroy, falling to his knees, pointed out that that zombie-detection alarm was still going off. So not only did the experimental cure turn out to be a complete dud, but Xiangxiang had wrongly accused the innocent Lab Assistant! “SHADDUPSHADDUPSHADDUP ALL OF YOU GET OUT, JUST GET OUT AND LEAVE ME ALONE! I didn’t mean to kill her!” wailed Xiangxiang in despair, refusing to break character as all of us shuffled past her to leave the room. The last day of the workshop was much less exciting at the start. The children were encouraged to improve and fine tune their stories, writing out a complete final story draft under the tutelage of the trainers. The group leaders and trainers went from child to child, encouraging them and helping to iron out kinks in their plot lines whilst correcting their drafts for grammar and punctuation. Each child was given a booklet for which to use to illustrate and copy out their completed story. This took up most of the time of the last day. Finally, all the worksheets and booklets were collected by the trainers (so that the work could be organised neatly), and it was time for all of us to leave the room for a short break which the kids welcomed. The excuse given was that Sgt Leroy was working with another of the MUTB trainers to find a new cure, one which actually works! When we returned, Sgt Leroy had built himself a barricade and was pacing around inside of it like a caged lion. It turned out that he’d discovered some hidden CCTV footage of Leader Xiangxiang revealing herself to have been bitten in the leg by a zombie, and conspiring with one of the other MUTB trainers to frame the Lab Assistant. So Sgt Leroy completely lost his marbles, destroying the zombie cure and executing everyone in the room one by one, to Dramatic Music!! As the music stopped, all the MUTB trainers who had been playing dead on the ground got up for a curtain call, and we clapped and cheered for all of their hard work! 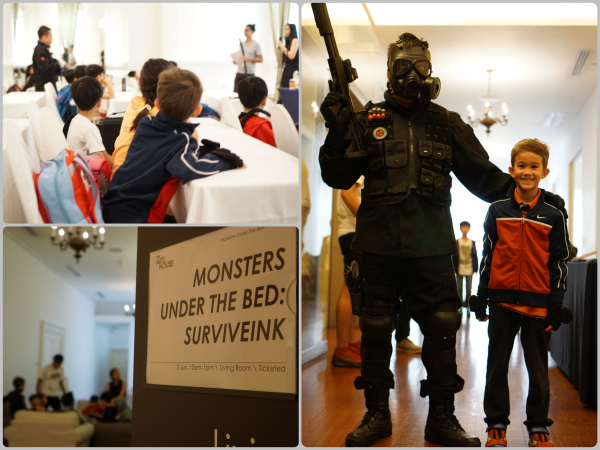 Thank you to Monsters Under the Bed for this super-exciting experience with SurviveINK! We all thoroughly enjoyed ourselves and we are looking forward to attending more creative writing workshops with MUTB! Monsters Under the Bed are running more INK workshops during the September, November and December holidays this year, so if you’re interested, definitely sign up as spaces get snapped up really fast! You may have seen our video from last week, ‘We’re Going On A Bear Hunt’ that was part of J’s kindergarten project! It was J’s first time having to be in charge of making the video and he learned so much about each stage of movie-making from story to film. We also put together a ‘Behind the Scenes’ video so that J could share the whole creative process with his classmates and teachers. 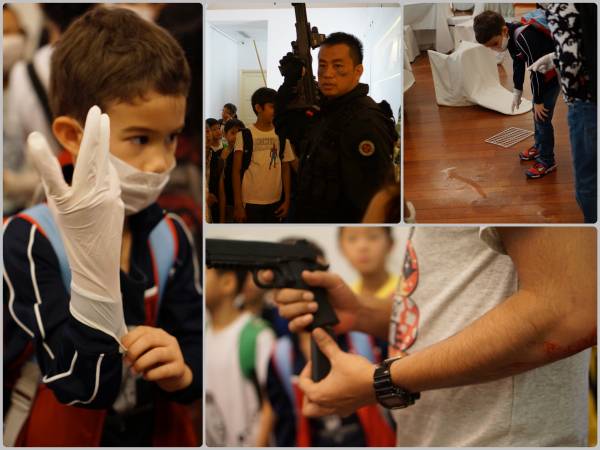 Singapore may be a small country, but there are no lack of activities to do here with the kids! The Barn Owl and I have our favourite haunts that we love to visit with the family, but on occasion, we would like to take the kids someplace new. Barn Owl: Let’s go somewhere new! Debs G: Ok! Where shall we go? Barn Owl: Dunno. Any ideas? One hour later, we still haven’t come to a conclusion and now we’ve wasted half the morning. We end up going to the same ole park downstairs. Again. This is why I really appreciate this great new guidebook “Got Kids, Go Where?” by Kelvin Ang. He’s the daddy blogger over at CheekieMonkies which has featured many reviews of kid-friendly indoor and outdoor activities over the years. The guidebook is comprised of 50 chapters divided into seven main sections (PLAY, NATURE & SPORTS, EAT & SHOP, ARTS & HERITAGE and TRAVEL) and there are two extra sections at the back featuring some of their favourite places and a few more miscellaneous activities. All in all, there are exactly 500 ideas of things to do and places to visit in Singapore! Each activity or location listed in the book comes with a short descriptive blurb (of the sort that you might find in a tourist attraction pamphlet) as well as a rating from 0-5 monkey faces, but what makes it extra special is the brief personal recommendation which tells you exactly why it is a place beloved by Kelvin and his family and what they like best about it. (This little recommendation is aptly captioned ‘Cheekiemonkies Love’). Each of the 50 chapters is written in the form of a top 10 list, with the number one recommendation receiving a ‘CheekieMonkies Rave’ golden seal of approval. The only thing I disliked about the book was the arbitrary rating system, which provides no point of reference as to why certain places are rated more highly than others. This system was quite distracting as none of the activities rate below 2.5 and all the descriptions in the book are very positive, leaving me wondering why anything received less than a 5, as no warnings or drawbacks are mentioned. In any case, the book is clearly a collection of personal recommendations, including only kid (and parent! )-approved activities that are worth spending time and money on, so it is definitely a useful reference and would make a great gift for families with kids of any age. I also think that this would make a great ‘welcome to Singapore’ gift for families visiting Singapore for the first time, or expat families coming to stay! Owls Well recommends: Get this book, keep it in the car, challenge your family to visit one new place every weekend and see how long it takes for your to make it through every single activity! 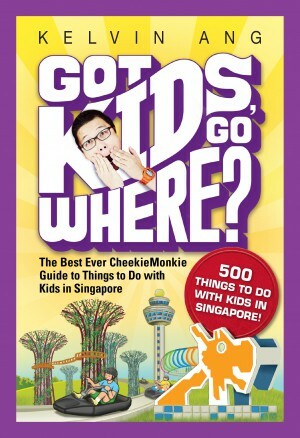 I was very fortunate to be able to conduct a brief email interview with Kelvin Ang, the author of ‘Got Kids, Go Where?‘. 1. I really enjoyed looking all the activities listed in ‘Got Kids, Go Where?’ and was very impressed by how the book is organised. What was the most challenging aspect of putting this book together? The most challenging aspect has got to be finding 500 activities to fill the book. When I first started writing for the book, I thought it would be impossible to include that many activities but the more research I did as time progressed, I realised there are actually so many activities and places for families to discover in Singapore. 2. The list of activities and destinations in your book is so extensive! How did you decide which activities and places to include in your book? The activities and places I picked first had to fulfil the criteria of being family-friendly. I also had my 3 kids – mostly my 2 older boys – to help me out in coming out with the rating system for the activities so the list is definitely approved by kids! 3. After the book went to the printers, was there anything else you wished you had included in the final draft? Not really, except that the thing about guide books of this nature, some of the listed places may become obsolete due to closures. In fact, I just found out that a branch for an Indoor Playground has just shut its doors this month! 4. What is your advice to parents who are looking through this book for the first time? Cover your eyes, randomly flip to a page and point a finger to one activity! That’s the beauty of the book as it gives parents lots of ideas whenever the weekend or holidays roll along. A more practical way is to let you kids flip through the book and have them decide on the place or activity. In fact, the feedback I am getting from parents is it is their kids who are more interested in the book since it allows them to find out more about the places that they never knew or been to! A Special for Owls Well Readers: Well done for reading to the end! Armour Publishing is kindly sponsoring a giveaway an autographed copy of ‘Got Kids Go Where?’ by Kelvin Ang to ONE lucky Owls Well Reader! Huzzah! Like and share this Facebook Photo and tag three friends – make sure your post is public! P.S. 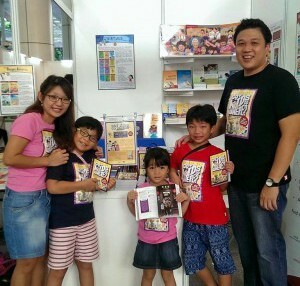 By the way, Kelvin Ang is also hosting a giveaway of his book over at Cheekiemonkies! P.P.S. Don’t just take my word for it – check out the review over at Growing With The Tans too! Update: This giveaway is now closed and the winner has been emailed – thanks for playing! Your conversation with the Boobook in the National Orchid Garden is hilarious! I gotta say that our National Orchid Garden is a wonderful place to bring friends who are visiting Singapore for the first time. 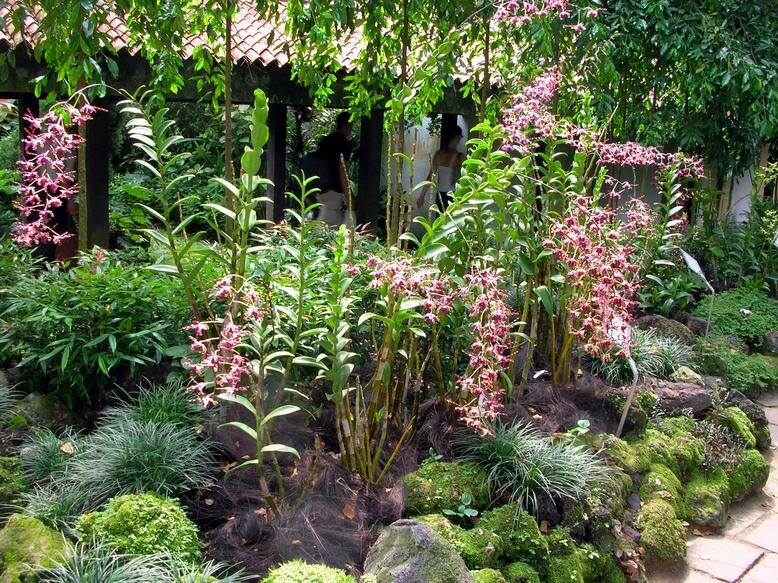 Not only does it have a gorgeous collection of orchids which are rotated regularly, it is beautifully landscaped so it is a joy to stroll through. It is no wonder that one of my friends (who is a Martha Stewart perfectionist type with an eye for beauty and design) chose Burkill Hall, the huge black-and-white house at the top of the hull, as the location for her wedding dinner! The VIP Orchid Garden is located just behind Burkill Hall and is styled as a traditional English backyard garden. This is where all the finest orchids from the Botanic Gardens orchid hybrid breeding labs are located, as part of Singapore’s longstanding Orchid Diplomacy programme. I do have a few favourite flowers in this little garden that I like to point out to visitors. The delicate white blooms of the Dendrobium Memoria Princess Diana are one of my favourites. 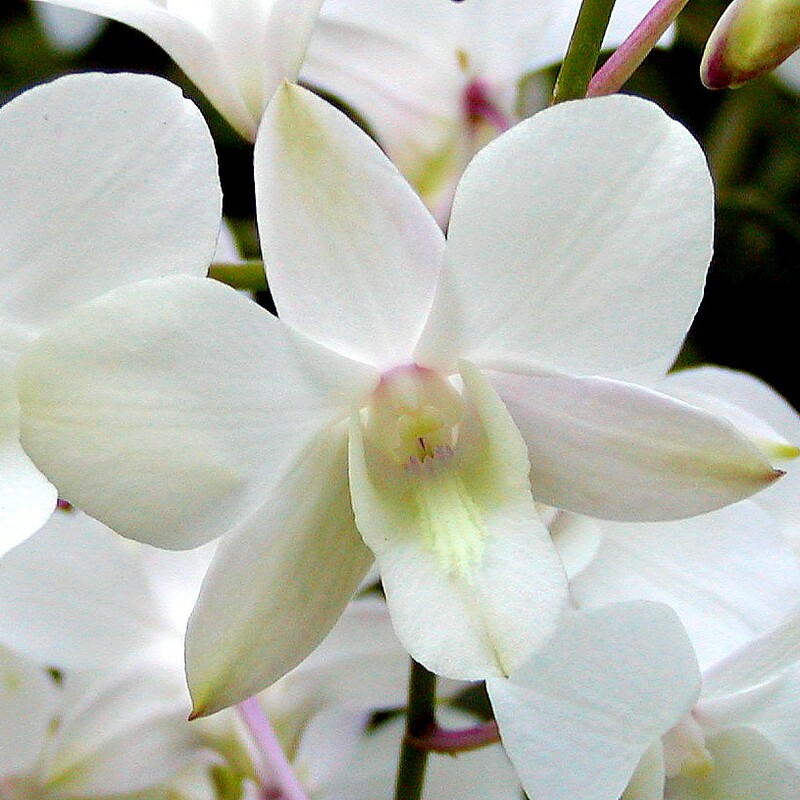 This orchid was actually bred in honour of Princess Diana, but sadly, she died just before her scheduled visit to Singapore, so the flower had ‘Memoria’ added to its name. Although Princess Diana never got to see her orchids, during the royal couple Will and Kate’s visit to Singapore a few years back, the flowers were specially planted in a large pot so that they could view them. I also like the star-shaped Paravanda Nelson Mandela, which has green and yellow petals speckled with rusty red which reflect the colours of the South African national flag. One of the most appropriately named flowers in the garden are the Doritaenopsis Sir Elton John which has very large and fancy blossoms that are white and gold with an eye-catching splash of purple! Loud and showy, just like the entertainer himself. 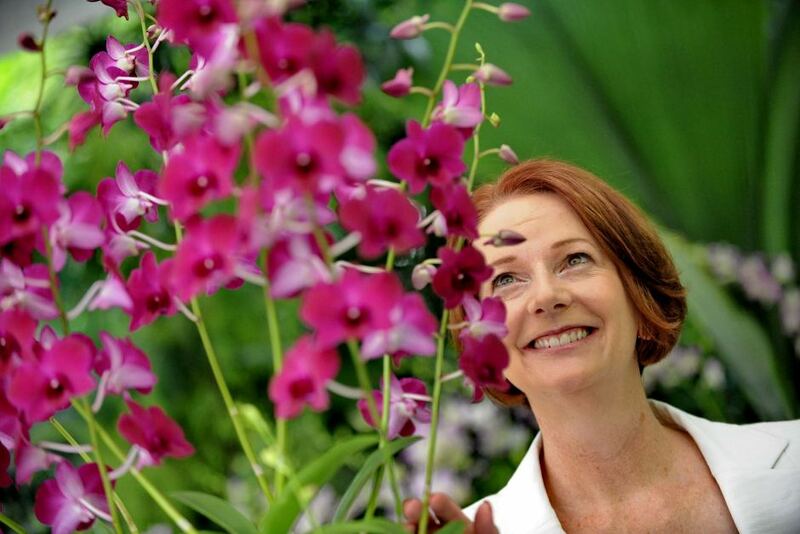 I have no doubt that if Tony Abbott sees fit to visit our tin pot little Asian country, he might have an orchid named after him, just like Julia Gillard did when she visited Singapore. 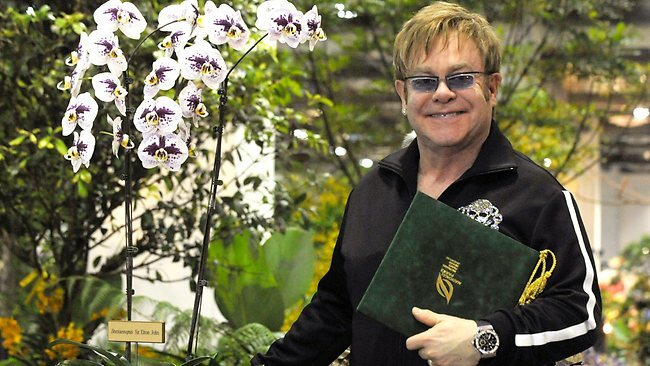 Maybe a little orchid diplomacy is needed to get him to feel more kindly towards Southeast Asia! I think they gave her these bright flowers because of her bright hair. Dendrobium Bindi Irwin. Green with Gold Flecks. Boobook: So, this is the Dendrobium Bindi Irwin. 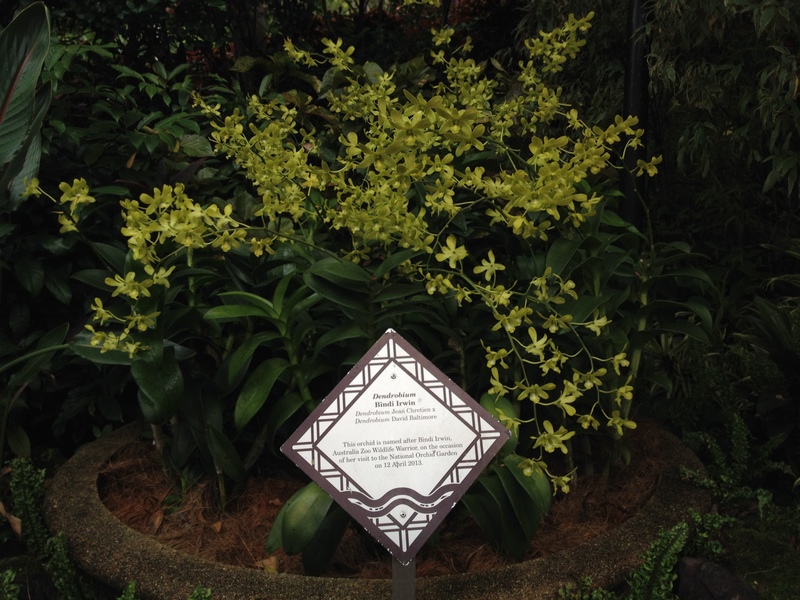 A Becky Lee: Yeap, sometimes when a celebrity comes to Singapore, they get an orchid named after them at the Botanic Gardens. Boobook: It’s green and gold. A Becky Lee: Yeap, they breed these specially, taking into account the position, personality and behaviour of the person they’re based on. Dendrobium Margaret Thatcher. Note the Curliques. Boobook: These are for Margaret Thatcher? 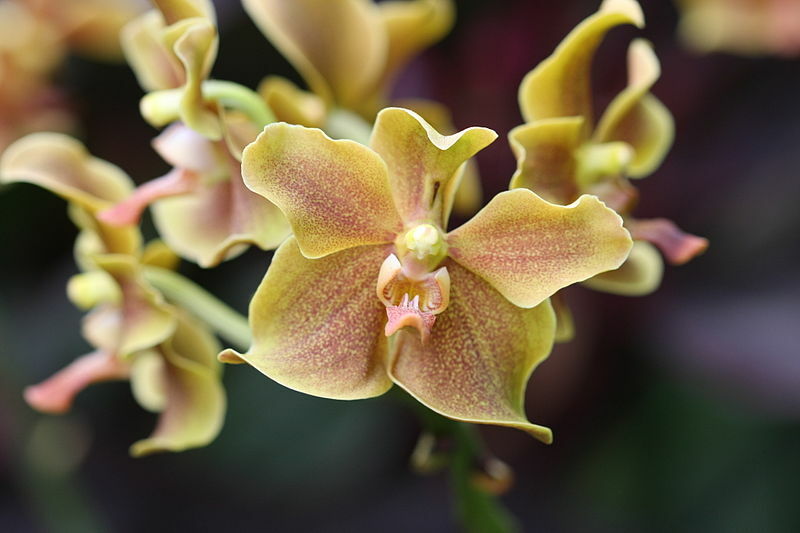 A Becky Lee: Yeap, they’re called the Iron Lady orchid, or Dendrobium Margaret Thatcher. Says here that they represent the strength and determination of the Iron Lady throughout her political career. Boobook: I wonder if they’ll ever make a Dendrobium Tony Abbott. A Becky Lee: Well, he’d have to visit first, but they could make it with huge petals on the sides for his giant ears. Boobook: And those curliques on top for all his twisted thinking! A Becky Lee: And big pistils for all the vile rubbish he spurts out! They can make it a garish orange with red splotches too, just like his face when he gets all mad. Boobook: It can be carnivorous too, so that the mouth is big and catches flies. Since he’s got a big mouth anyway.